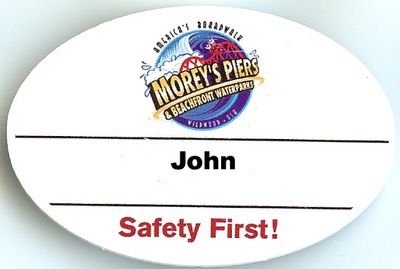 Our Custom Magnet Name Tag is attached by placing the magnetic piece inside the staff member's clothing, placing the printed name tag on the outside. This name tag lengthens the life of any uniform by reducing the wear and tear from safety pin holes. The magnetic name tag is customizable. Reduced risk - the rusty safety pin is no longer a facto. Tags do not include personnel names; you add those as needed, using your label machine. There is a one-time setup fee of $35 for custom logos. Minimum order 50 pieces for custom logo. Please allow 2 -3 week lead time after art has been approved.